There are many types of user groups that want to explore the outdoors. The top 3 accessible trails (trails designed with Boomers, wheelchairs, families and the general public in the forefront of the planning process) in Prince George are: GWL Mobility Trail, The Ancient Forest and Forests for the World. Drive 30 minutes (23km) south on Highway 97 until you turn left on Buckhorn Rd. Follow Buckhorn to Scott Rd, also on the left. Follow Scott Rd until you reach the gravel road and the parking lot will be on your next right. You can drive right up to the trailhead and park. The trail meanders through a forest of Douglas Fir trees and truly is a beautiful place to venture. There is one very clearly marked wheelchair accessible trail. The trail is 450 meters, following Dougherty Creek and offers 8 benches throughout for occasional breaks and to take in the serenity. Try to spot some hidden friends on the trail: gnomes, tree faces, angels, owls and more, that have been placed in discreet spots throughout the trail. Located 1.5hours (113km) east of Prince George on Highway 16 there is a well-marked sign on the right hand side of the highway to lead you into the parking lot. The Ancient Forest is a wet belt forest filled with ancient Western Cedar trees. During my first visit to the Ancient Forest I couldn’t help but wonder, “How does a forest like this survive in the harsh climates of northern BC?” After a bit of research I found that the cedars actually thrive on the water that comes down from melted snow packs in the mountains. The Ancient Forest is a truly magical place and it deserves to be seen by everyone. A group of local volunteers began the project of building a universal boardwalk through part of the forest which was completed in August 2013. The boardwalk takes you through the ancient cedars and ends at a creek runoff, which comes from the waterfall nearby. I’d say the Ancient Forest is one of Northern BC’s secret gems, it’s the first place I take anyone who is visiting this beautiful region. Forests for the World is located right in the city of PG upon Cranbrook Hill. From Highway 97 (Central Street) turn onto 15th Avenue, turn right onto Foothills until you reach Cranbrook Hill Rd (left hand side). Cranbrook Hill is very steep so please take precaution; continue up until you reach Kueng Rd. Turn left on the gravel road and continue to the end where you’ll reach the parking lot and trailhead. There are many trails within Forests for the World; though, there is only one loop around the lake that is fully accessible. Follow the map located at the trailhead to navigate the loop to Shane Lake. I believe it’s the best trail in the forest! The Shane Lake loop trail is 1km in length, relatively flat and maintained so it’s accessible to those of varying abilities. Forests for the World is a must see while in the city, regardless if you get around on two feet or two wheels! This horse-drawn sleigh was used by the Prince George Fire Department from 1918 to 1928 to haul fire hoses and other firefighting equipment. It was manufactured in Winnipeg – similar models were used by fire departments across Canada. The sleigh and other fire equipment from the past can be seen at the Central B.C. Railway and Forestry Museum, open year ‘round at 850 River Road Road near Cottonwood Island Park. The Prince George fire department celebrated their 100th anniversary in 2015, which was also the 100th birthday of the City of Prince George. Thousands of years ago, as glacial ice sheets melted and formed the Nechako and Fraser Rivers, the steep sandy slopes known as the cut banks were formed. They have long been a Prince George landmark inspiring artists and photographers. The cut banks were the site of North America’s only ski race on sand, called Sandblast. First held in 1972, the race attracted participants from all over the world, including Canadian ski champions. It was discontinued in 2004 after three people were hurt while trying to navigate the course on a couch rather than skis. High on the cutbanks in McMillan Creek Park, hikers and picnickers enjoy walking trails, interpretive signs, and spectacular viewpoints overlooking Cottonwood Island Park and the City. The Northern Hardware and Furniture store on the corner of Third Avenue and Brunswick Street downtown was founded in 1919. A room upstairs houses artifacts including the first vacuum the store sold (a manual bellows) that same year.Originally on George Street, the business has been at its current location since 1940. It is the oldest family-owned business in Prince George, still run by the Moffat family. The store’s motto: If we don’t have it you don’t need it! The plaque next to this unique statue of Bridget Moran, 1923-1999, describes how the prominent social worker, activist and author worked tirelessly to support families in the region. The sculpture was created by artist Nathan Scott and is located at 3rd Avenue and Quebec Street downtown. Scott also created the statue of Terry Fox found in the Community Foundation Park at 7th Avenue and Dominion Street. The Northern Lights truly are Mother Nature's beautiful creation. Living in Northern British Columbia in Prince George we have the privilege of experiencing her beautiful dancing Aurora Borealis. This gorgeous performance in the night sky can be seen all year round with the proper tracking. This blog will discuss and answer a few frequent questions on how to see and photograph the beautiful Northern Lights. Before discussing the best way to view and photograph the Northern Lights, many people want to know what the Northern Lights are and how they are created. After some brief research I discovered they are the result of many collisions between gaseous particles in the Earth's atmosphere and charged particles released from the sun's atmosphere. The many, many variations in colour in the Northern Lights are due to the type of gas particles that are reacting with each other. The most common auroral color, a pale yellowish-green. Rare, all-red auroras are produced by high-altitude oxygen, at heights of up to 322km (200 miles). Nitrogen produces blue or purplish-red aurora. The Northern Lights can be seen in many different shapes and forms, ranging from patchy or scattered clouds of lights, to beautiful rippling curtains or shooting rays of light illuminating the sky with and eerie mysterious glow. Another pair of common questions is: what is the best location for viewing the Northern Lights? and when is the best time? As a photographer I'm always searching for the next best location, but for anyone trying to view or take pictures of the Northern Lights I would strongly suggest a quick drive out of the city. Prince George has light pollution which can make viewing the Northern Lights difficult and less vibrant; it's not impossible but you need a much stronger solar storm for city viewing. A quick drive in any direction out of the city at one of our beautiful lakes would be the best suggestion (Nukko Lake, West Lake, Shane Lake, Tabor Lake, Bednesti Lake, or Purden Lake). As for the best time, there really isn't one. My suggestions would be to Google an Aurora group and join one that has free email subscriptions for Yellow and Red Alerts. I combine an Email Notification, an iPhone Aurora app with Notification, and many Facebook groups with all sorts of Notifications. To chase the Aurora properly, I have found one must exhaust all options. To successfully photograph the Northern Lights all you need is a camera and tripod, For a successful night shot you need your camera to be on a sturdy object. Secondly you need a camera; preferably a DSLR camera and some Smart Cameras with the ability to control your Shutter Speed to a minimum of 5-10 seconds. Normally I will zoom my camera out so I can see as much as the night sky as possible, (24-120mm I would use 24mm) For night shots I use between 10-20 seconds for my Shutter Time. Why 10 seconds? You want the camera to let as much light in as possible. This is why you drive away from the light pollution of the city. It is also important to carefully select your ISO. I normally start off at 800 ISO, if it's too dark then bring your ISO up and vise versa. An easy set up guide for starting is: lowest focal length, 10-20 Seconds, and 800 ISO. Adjusting all the settings for the perfect shot is different every night and every location. The number one tip I will give everyone is to always have fun and enjoy what you’re doing on your night adventure, regardless of whether you’re taking photos or not. Mother Nature can be tricky sometimes. Don't give up if you’re unsuccessful on your first try. Most photographers will visit the same spot 5-10 times before achieving the photo they want. Thanks again for your time and reading my blog on the Northern Lights. If you want to follow any of my recent work, you can find me on Facebook at K.Foot Photography and Instagram @kfootphotography. Transportation is the reason Prince George exists in the first place, and it is why Prince George has developed and thrived for more than 10,000 years. That’s at least how long the Lheidli T’enneh (pronounced KLATE-lee TEN-ay) First Nation has called this confluence of two mighty rivers –Nechako and Fraser – home. This was the central transition point of busy aboriginal trade economies between the northern, west coast, prairie and southern communities of modern day Western Canada. Part of this network was a series of ancient “grease trails” overland. Three of the main local ones were named Nyan Wheti (between modern day Fraser Lake and Fort St. James), the Cheslatta Trail (Fraser Lake to Ootsa Lake), and Nuxalk-Carrier Trail (Quesnel to Bella Coola). These were the ancient roads, but rivers and lakes were the ancient highways. The Nechako, its watershed running east-west across much of the northern interior, was one of the most prominent. It connects to the Fraser which runs from the northern Rockies (accessible by Cree nations of modern day Alberta) all the way through the north-south breadth of B.C. into the ocean. The indigenous name of this region’s aboriginal people is Dakelh (pr. da-KELTH) and that word translates to “people who travel by boat.” Furthermore, the translation of Lheidli T’enneh is “people from the confluence of two rivers.” Transportation was so intrinsic to daily life that the people here named themselves for it. The typical Lheidli T’enneh canoe was made by hollowing a log from the giant cottonwood trees that line the local shores. These ceased to be seen on local waters during the bulk of the 20th century when colonial forces attempted to erase aboriginal culture. Dakelh nations are now reestablishing their traditional ways of life. In 2014, a partnership between the University of Northern British Columbia and the Lheidli T’enneh First Nation resulted in a hands-on class during which the students built and paddled the first cottonwood canoe in known memory. Canoe was what brought the first Europeans through this region. In spring of 1793, Scottish explorer Sir Alexander Mackenzie used the Upper Fraser River as his route towards the Pacific Ocean. First Nations contacts in this region warned the explorer that the southern Fraser’s rapids were deadly. They showed him the Nuxalk-Carrier Trail as a prudent detour. It now forms the last leg of the Alexander Mackenzie Heritage Trail. That year, on July 20, he and his band of voyageurs used it to become the first known humans to cross the continent overland. This spot was essential to transportation for another reason. Just north of modern day Prince George is the northern divide where, depending on where you stand, all the waters flow either south into the Pacific Ocean or north into the Arctic Ocean. This was a priceless geographic feature to the exploratory trading interests who used it to major economic advantage. An easy walk from a certain spot on the Fraser over a 14.5 km (nine mile) trail to Summit Lake was all that separated these epic forces of flow. The Lheidli T’enneh people were so aware of the importance of this route they called it “Lhedesti” meaning “the shortcut” and they were happy to show it to a pair of explorers in 1862 – John Giscome and Harry McDame – who transferred the knowledge to the feverish prospectors of the Omineca Gold Rush. The colonial government renovated the trail into a wagon road, steamships built a port on the Fraser, and it was where Albert Huble and Edward Seebach would build a farm and trading post. That homestead and the Giscome Portage are now conjoined historic sites beloved by tourists and local residents alike. Water was the easiest way through the northern wilderness, but the region’s 10 paddlewheelers were no better than canoes at getting through the southern Fraser rapids. Most were built at Soda Creek above the treacherous canyons and only worked north of that spot. Helping this cargo industry were pack-train operators using horses, mules and in Barkerville even imported camels. The most famous of these pack-train adventurers was Jean-Jacques Caux, known far and wide as Cataline. But these canoes, pack horses and steam ships were eventually no match for 20th century progress, and neither were the First Nations of the day. Although the rail lines and gold mines, coal hills and lumber mills were a boon for colonial populations, it triggered more than a century of misery for aboriginal populations. The coming of the Grand Trunk Pacific Railroad in 1914 almost immediately ended the usefulness of the paddlewheelers on the rivers. The steamships delivered the construction locomotives (one of which still pulls passengers around Lheidi T’enneh Memorial Park) and railway labourers - and their own demise in the process. The iconic 800-metre rail bridge (it was also the automobile bridge until 1987 when the Yellowhead highway bridge was built alongside) has a unique lift-span to let ships go under, but it was hardly ever used before they simply dropped anchor into the mists of time. Next, in the 1950s, critical rail lines arrived in Prince George connecting the ports of Vancouver, the coal and natural gas fields of Fort St. John, and interfacing with the older east-west lines. This strategic interconnection prevails to this day. On the same philosophies as rail, the provincial highway system also came to a crossroads here. Over time, a well-resourced international airport was also established on lanes connected to the roads and the rails. It all makes Prince George open for global business of almost every sort. Prince George is a human interchange. The signs are everywhere. They are on exhibit at facilities like Exploration Place, the Railways & Forestry Museum, the Historic Huble Homestead, and out in open every-day view like where Mr. PG stands and the steel train bridge used by CN Rail today. It is still possible to launch your own canoe and feel the natural currents that have moved people through this area for more than 10 millennia. It also moved many of us to stay. Guardian Aerospace Flight Seeing Tour: This is the backcountry frontier. I’ve had my share of world travels, but there is no scene so complete, in my mind, as the winding Kitchi Creek, unfurling into the McGregor River from Kakwa Provincial Park, with the towering Mt. Ida presiding over it all. In October 2015, I took a flightseeing tour with Guardian Aerospace and two other photographers to Kakwa Provincial Park. Our Cesna 172 followed the Torpy River into the mountains east of PG, and on the way we window shopped for what will be years worth of alpine hiking trips. Then, the massive, humbling rock faces of Mount Sir Alexander sprung up around us, and the legendary landscapes of Kakwa seemed just beyond our reach. The park is renowned for its dramatic, mountainous scenery, but also revered for its remoteness. As such, a flight tour in the park is a visual feast for anyone to enjoy, but for a backcountry enthusiast, it’s a must have experience. It so happens that Kakwa, the Cree word for “porcupine,” has been on my hiking bucket-list for a few years: an endeavour inspired by recent photography from adventurers before me. Like many recreational areas in the region, this one’s modern access was made by mining and forestry activities, then it was established as a park to protect it from those same industries. To give you a sense of the area’s relatively untravelled newness, its highest peak was not winter-summited until 1990, and it did not receive Class A park status until 1999. If you’re prone to wilderness wanderlust, a flight seeing tour in the mountains is the ultimate tease. In a couple short hours you will see Arctic Lake and Pacific Lake side by side at the continental divide, scarcely trodden hiking routes, rarely touched mountains and hardly travelled waterways. These inspiring elements are all key to the allure of northern BC’s barely explored adventuring frontier. #TAKEONPG Tourism Prince George hit up Powder King with local snowboarder Brad King for some spring boarding. For 365 activities in and around Prince George, visit www.takeonpg.com! To live in Prince George, you have to like winter. We actually get a bit (or a lot) excited when the snow starts to fly, as we start to itch for our favourite winter activities. Luckily for us, there is a huge array of fantastic activities to choose from in our city; snow covered grounds or fallen temperatures are not reasons to stay away, but an invite to come and play! Here are three family friendly reasons to visit Prince George during the winter months. An article about winter activities in Prince George would be amiss if it didn’t mention the opportunities for skiing and snowboarding in our region. There are four different hills, in a range of sizes and challenges, within daytrip distances (and shorter) to Prince George – and the powder, of course, is amazing! The Hart Highlands Ski Hill is a small hill in a suburb only ten minutes north of the downtown core of PG, but it’s fun for the whole family – a great place to bring kids who want to try downhill for the first time or work on finding their groove. Tabor Mountain Ski Resort, only 15 minutes east of PG but with over 20 runs, is where I learned to snowboard years ago, and is great for a whole day or a half-day, being so close to town. Purden Ski Village is 60 km east of Prince George, and is a great option for both a half-day trip and a full day, especially if you take advantage of their shuttle and sleep on the way! There are 25 runs at Purden and the views of the snow-covered landscape and Purden Lake are phenomenal. And finally, Powder King Mountain Resort, found in the Pine Pass in the Rockies, is just over two hours north of PG. Powder King has an amazing 37 runs, boasts over 40 feet of powder every year and a shuttle is also available (a great option to avoid more travel time on our wintery roads). Locals and out-of-towners alike will enjoy taking in some Prince George Cougars or Prince George Spruce Kings games (or both) every season. I’m not even a big hockey fan (gasp, sorry!) but I enjoy heading to the arena at least once a year. It’s a great excuse to eat popcorn and hot dogs, and cheer for the locals/yell at the opposing team! But real hockey fans will love to see these WHL or BCHL athletes in action. CN Centre can draw in big crowds for the Cougars’ games, making for a very exciting evening, and the PG Coliseum and the Spruce Kings’ games can be a really fun family night too. (And note, the City of Prince George offers public skating times at the Coliseum in the winter too!) What a great reason to spend an extra night in Prince George, especially if the kids are hockey fans, or even aspire to the bigger leagues one day themselves! Snowshoeing is one of my favourite ways to spend some of our snowy days, and I love that in Prince George, I can drive short distances in any direction to find some good trails (or places to make my own). Heck, I can even snowshoe from my driveway if I want to. But when I really want to experience the quiet, magical, snowy wonderland of our region, I head somewhere a bit more special: the Ancient Forest. Just over an hour east of Prince George, you’ll find this rare temperate rainforest area with several kilometres of trails, interpretive signs, a beautiful waterfall and some of the biggest ancient cedars you’ll lay eyes on in our region. While I particularly love the Ancient Forest in the winter (it’s just so calm and quiet! ), the area is great hiking all year round, especially now that local volunteers, led by the Caledonia Ramblers hiking club, have completed a 1600-foot boardwalk, making the trails accessible to all. When it comes to locations for winter activity around Prince George, especially snowshoeing, the possibilities are endless. With a maze of trails that can be accessed both within the city limits, as well as in the surrounding areas, it can be difficult to choose the best place to hit the trail. There are both private and public options for snowshoeing venues nearby. The most popular option for a private venue is the Caledonia Nordic Ski Club. This is a non-profit organization, but there is fees to use their trails. As far as the public options go, although there are many, there is three main trails (or trail systems) that come to mind when I think of great locations to get out in nature. Eskers is a great beginner / intermediate location for snowshoeing near Prince George. With 15 kilometers of marked trails, you can do anything from a quick 20 minute walk with the kids, to an all day excursion, exploring all of the trails that Eskers offers. The trails weave through the numerous lakes and marshes that make up the park. Often in this pristine habitat, you will even be lucky enough to come across some of the local wildlife such as grouse or moose. While snowshoeing is one of the highlights of winter in this particular park, there is no track setting. This park can be found north of Prince George, just south of Bear Lake. While in the summertime this park consists of a popular campground, during the winter the gates are closed at the highway. Luckily, this is part of what makes it great for snowshoeing! Not only is there marked trails throughout the park, but you can also embark down any of the road systems that navigate throughout. For shorter ventures, the bear lake trail around the main lake is quite popular, but if you are ambitious and feeling up for a bit longer jaunt, the square lake trail takes on a large loop which then joins up with the crooked river trail to take you back to the main (bear) lake. Similar to Eskers there is no track setting in this park as well, although this is also a popular destination so it is usually not an issue. Viking ridge is, by far, the most technical of the three locations. This should only be considered my advanced people since it is a very steep trail and takes you above treeline on to a mountain ridge. The views that you obtain on this trail are second to none. You can see a full 360 degree view of all the surrounding, low lying, areas. The trail starts with a steep ascent through the forest which takes you to an open meadow. From there, you climb higher to a small lake, and then finally on to the ridge. The Viking ridge trail is not track set, and although there is flagging on the way up to help you navigate, it is not recommended for unexperienced outdoors people. For both Eskers and Crooked River, detailed trail maps can be found online at the BC Parks website (www.env.gov.bc.ca/bcparks). For Viking ridge, information can be obtained through the Caledonia Ramblers website (www.caledoniaramblers.ca). 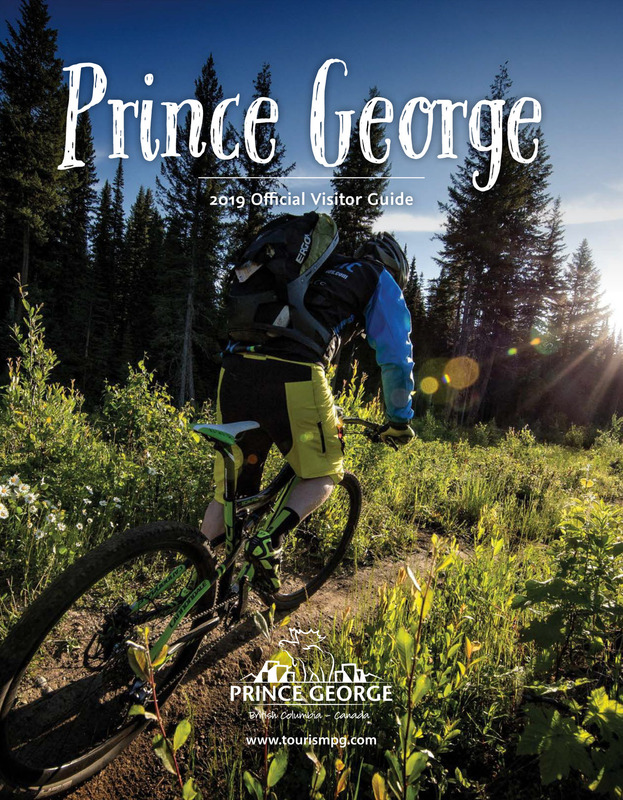 Whether you choose to embark on a venture to one of these locations, or just find one on your own, you are sure to experience nature at its finest around Prince George. After all, is there such a thing as a bad day when you are in the great outdoors with snowshoes strapped to your feet? The ten-day event will run from February 5-14 and include a number of events such as The Integris Iceman competition; Cougars, Spruce Kings, and Timberwolves games; cultural performances; and the annual Chinese New Year Celebration at the Exploration Place. It will also include free admission to a variety of City facilities on Family Day. The highlight of the festival will be the Plaza event on February 13 including concerts, food trucks, activities, displays, and fireworks.